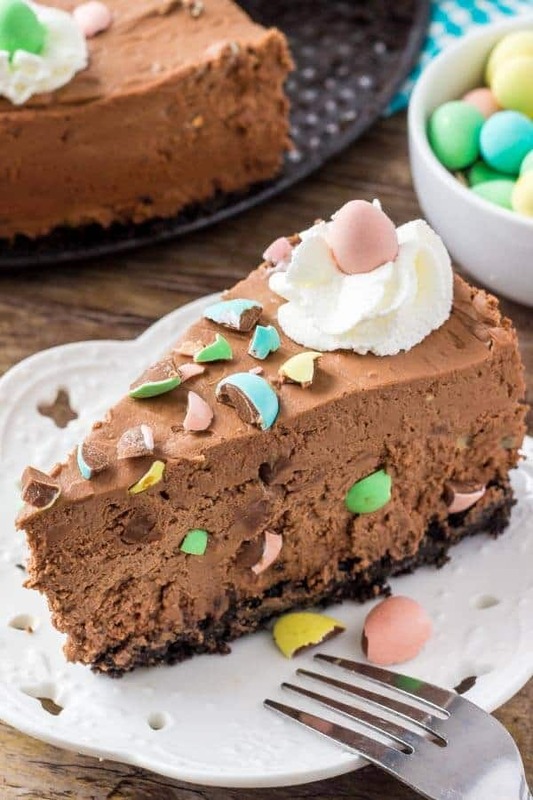 This no bake mini egg chocolate cheesecake is completely decadent, completely adorable and perfect for Easter. 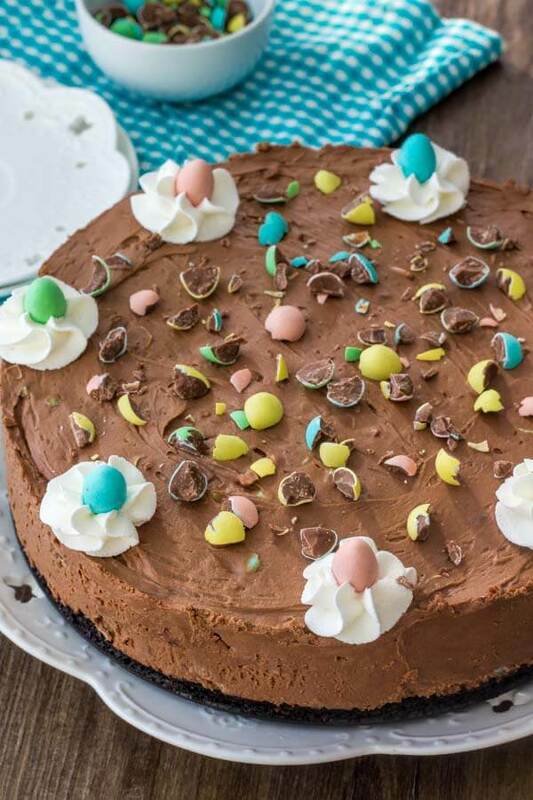 Crunchy Oreo cookie crust, creamy silky smooth chocolate cheesecake, and loaded with mini eggs – it’s the one thing you NEED to make this Easter. I have a bit of an addiction to mini eggs. To be honest – the addiction is really to all Easter candy. But if I had to pick a favorite, it would be mini eggs. If you’d like to hear a very embarrassing story about my Easter candy addiction – keep reading. Or just skip straight to the recipe. If truth be told, my first ever sentence as a child was about Easter candy. I guess my parents had rationed Easter candy since I was (obviously) a toddler. And one night after I finally had finished off the chocolate – I exclaimed “No more choc-y bunny”. And then started crying. Yes, you heard correctly. My first ever sentence was about running out of chocolate. Apparently not much has changed in twenty-something years….. But onto today’s Easter cheesecake recipe. Mix together crushed Oreo cookies (wafers and filling) with melted butter. Press into the bottom of a springform pan and pop in the freezer while you make the filling. Whip heavy cream with a little powdered sugar until stiff peaks form. If you want to save time, you can even substitute heavy cream with cool whip so you don’t have to make your own whipped cream. Beat the cream cheese until nice and soft – then mix in the powdered sugar, melted chocolate and sour cream. Fold in the whipped cream, along with crushed mini eggs. Then spoon the batter over top of the Oreo crust, smooth the top, and place in the fridge to chill. You can seriously make this no bake cheesecake in under 15 minutes, then it’s time to set in the fridge. When you’re ready to serve, sprinkle on some more mini eggs and a little whipped cream – and you’re good to go. The colorful eggs make this cheesecake look super pretty and festive for Easter. 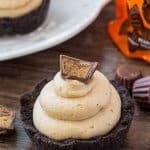 And it’s seriously the smoothest, creamiest, most delicious chocolate cheesecake recipe you could imagine. 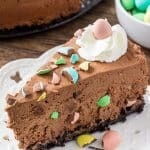 This mini egg cheesecake seriously deserves a spot on your Easter table, and it just might be my new favorite way to enjoy Easter candy. Heck – you can even make it after Easter with your leftovers! 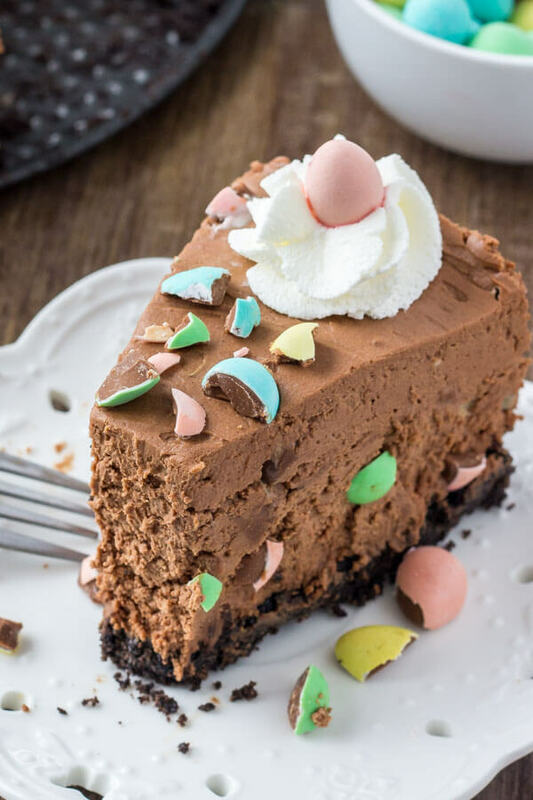 This no bake mini egg chocolate cheesecake is completely decadent, completely adorable and perfect for Easter. 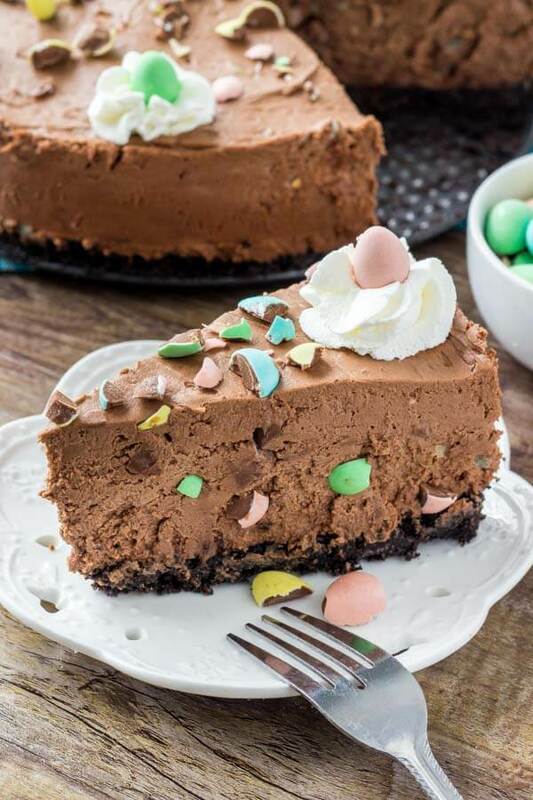 Crunchy Oreo cookie crust, creamy silky smooth chocolate cheesecake, and loaded with mini eggs - it's the one thing you NEED to make this Easter. Mix together the Oreo crumbs and melted butter. Press into the bottom of a 9 inch springform pan and place in the freezer to set. In a large bowl beat the whipping with 1 tablespoon of the powdered sugar until stiff peaks form. In a separate bowl beat the cream cheese until soft. Mix in the powdered sugar, melted chocolate and sour cream. 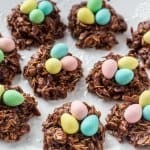 Fold in the whipped cream, followed by the crushed mini eggs. Spoon the batter on top of the Oreo cookie crust and smooth the top over. Place in the fridge to set for at least 4 hours. When ready to serve top with whipped cream and more mini eggs. *Store in the fridge in an airtight container. I’m excited to make this for Easter. What size of spring foam pan did you use? Geez I should have read more closely. 9 inch. Thanks! 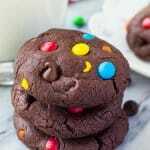 Can you use chocolate chips? Or does it need to be baking chocolate? Never mind, I see that you do not. Sorry for the dumb question. Happy Easter! Will this be okay to make a day in advance before serving? That would definitely be fine! Can’t wait to try this. Do you use the cream of the Oreo cookie as well? Can I crush them in a blender? Yes – you’ll use the wafers and the cream. It’ll depend a little on your blender and it’s power, but it should be fine. You can also put the cookies in a ziploc bag and then crush them by bashing the bag with a rolling pin. Happy Easter!